A warm welcome back to all children, families and staff after the festive celebrations. 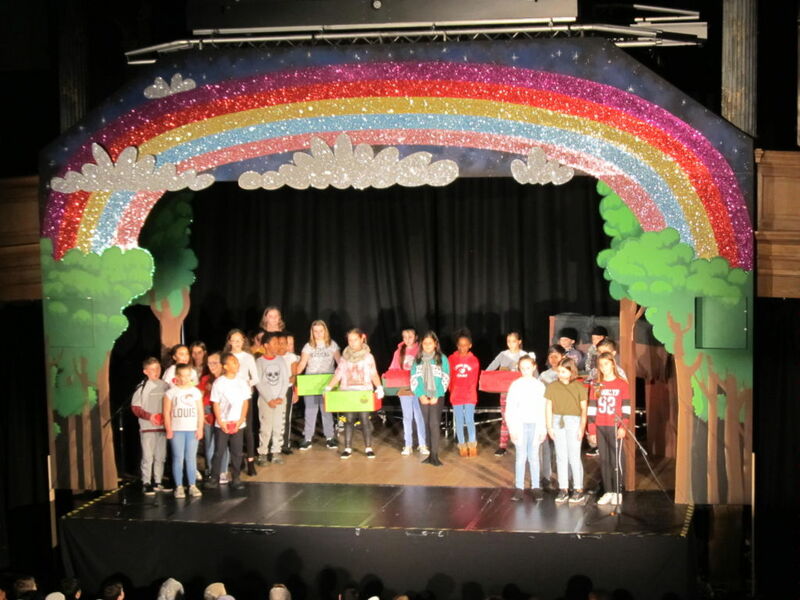 The New Year of 2019 will be an historic year for the school as we complete our first year as a full primary school. For the first time we will have children completing Year 6 and leaving us for their High School adventure, what an exciting year we have to look forward to. We were all super proud of the children’s performances in the school Nativity. Well done St. George’s. We use the highly successful Read Write Inc. Phonics programme to teach our children to read, write and spell. Our children do well in the phonics screening check and by Year 2, the majority are fluent readers with the best chance of success in the KS1. 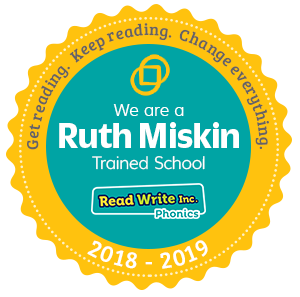 Ruth Miskin Training recognises us for teaching the programme with fidelity and passion – we know what it takes to make reading and writing pleasurable and rewarding for our children. After around two years of planning we finally have our new Outdoor Area for Reception and Nursery children. We have created areas for play and learning which include a dry river bed and water feature, a workshop, an outdoor kitchen, sandpit and even a Hobbit Hole! Cool Canvas who designed and built the area for us have made a video of the build to show you how it grew. Watch out for our grand opening event coming soon! 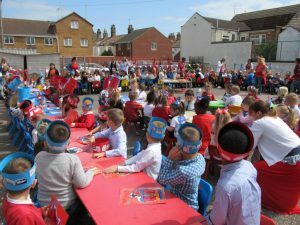 To celebrate Prince Harry & Meghan Markle’s wedding we held a playground tea party for the whole school. The children made flags, crowns and placemats for the party. Each class decorated a cake and everyone wore red, white and blue and we all stood for the National Anthem showing our commitment to the British Values. Welcome back – we hope you all had a lovely Easter. Remember to bring in your Easter Hats for the holiday competition by Wednesday 18th April. See all the entries and winners for our potato competition in ‘Past School Events’ under ‘news’. Due to the snow, the deadline for the potato competition has moved to this Friday (9th March). Dress and decorate them as your favourite book character. School reopens on Monday 5th March following the snow closures. We are sorry for the inconvenience caused to families but hope that parents understand that the safety of the children and staff must always come first. Come to school dressed as a character from a book this Thursday. For an extra challenge can you dress a potato as your favourite book character? You could even create a scene to put it in.